Nisus Gallery is pleased to present new oil works by demarcona. Organic shapes emerge loosely, and then, weave together tightly to form new geometric shapes. 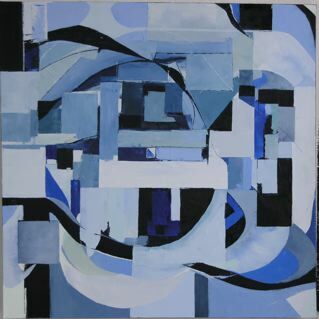 Through a circular process of movement and change, her compositions reveal the essential. Underlying focuses and refines a fundamental and intrinsic viewpoint. The new works are a derivative of low altitude aerial photographers of cultivation patterns. Retreating to and from organic and purely geometric compositions these oil works see nature as the endless source of inspiration, providing pattern, chaos, movement and vivid color. As in her previous works, demarcona draws upon the early modernist tradition to expose underlying rhythms. Underlying will be on exhibit at Nisus Gallery, 328 NW Broadway #117 (at Flanders), from June 2 through the 25th, 2011. The opening reception is on First Thursday, June 2nd from 6-9 pm. Nisus Gallery is open Saturdays 12-5 pm and by appointment.